What is currently the best source for Hermann Meyer caps? I've been trying to source these from different suppliers for my group but all I have is 4 rubbish items in a pile. I'm thinking of starting my own run of these caps as I'm running out of ideas. How popular are these caps in the re-enactment scene? 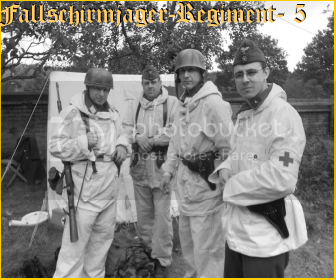 Which re-enactment groups do Ramcke Paratroopers in Africa or HG in Africa and Italy? Christian I got one off one of the Chinese sellers on eBay Yungchunhe2008 or something like that I wasnt happy with the OR's chinstrap crap quality and naff bevo but since I was converting it to officers It didnt matter, often ridiculed by re-enactors as looking silly it was widely used in Tunisia c.1943, I have some rare colour pics of it being used by HG personnel along with Plane Tree SS camo smocks. FJR-5 in the UK do at least one show a year as Tropical, timing it to high summer in the forlorn hope it co-incides with a rare sunny day. I have a primer on whats available repro but the board does not accept uploads in Wps or Pdf format, contact me direct if you wish a copy remember to include your regular eMail addy, its not a big file. I got one of Yungchunhe2008. Yes I must admit the strap is rubbish, and the top of the cap seems to be somewhat wide. I got something to start off with. In the golden brown colour, not khaki. I'm still trying to make some proper insignia for it and also some leather chin straps. Will try and source them locally as it's better to assure quality control. As you said, they were very popular with HG troops in North Africa and Italy. That is a visor cap strap, which I already produce. The one for the Herman Meyer cap was very particular.